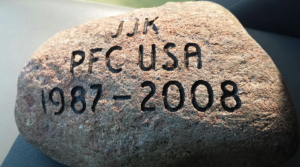 PFC Justin J. Kennie, son of Karen Kennie and Philip Stewart, lived in Westbrook, ME until he turned 11 years of age before moving to Cornish, ME – the town which he considered his home. PFC Kennie was struck by a motor vehicle on November 2, 2008 while crossing Interstate 81 in Watertown, NY. He was stationed at nearby Fort Drum. Ever since he was a young boy, Justin wanted to be a soldier. Throughout high school, he was actively engaged as a member of the ROTC program. He achieved his dream soon after graduation when he enlisted into the U.S. Army. Justin is described by his closest friends and family as being an extremely high-spirited young man who loved to cook and play paintball. He was a selfless and passionate individual who always took the most optimistic outlook upon any situation. His mother, Karen Kennie, illustrates him best by his unyielding upbeat personality. “He was my day,” she says. “He was always smiling.” So much, in fact, that his Drill Sergeants’ named him “Skittles” during Basic Training. Karen describes how before Justin passed, he hid a time capsule in the backyard of their home. This capsule is yet to be dug up, however, she looks forward to the opportunity of retrieving this capsule sometime in the near future. The capsule is buried in a strawberry patch which Justin made for his mother. The stone which will be carried forth within The Summit Project was retrieved from a rock wall which lay near this strawberry patch, just to the right of Justin in the picture above. It was an honor yesterday to carry the stone of Justin Kennie as part a Summit Project hike through the city of Portland. This hike, undertaken by 10 members The Army Cadets of America, did an urban version of a Summit Project by traversing the city from the Eastern Promenade to the Western Promenade and climbing the Portland Observatory and Franklin Towers as “summit” climbs. You would be pleased to know that the heights afforded views of both Westbrook and Cornish, locals that Justin knew well. As someone who can go from “0-60”, it was humbling to know that Justin had such a caring, friendly, and outgoing personality. I often reflected on this aspect during the trek, hoping that I might learn to acquire just a bit of Justin’s upbeat nature (Skittles!). I also found it striking how a photo of Justin had the very stone I was carrying in the background…a reminder that our time on this side is so short and it is people like Justin who make a difference. The thought of time came to mind, too, due to the time capsule Justin made and buried in the strawberry patch. I got to wondering what items he put in the capsule… Several years ago I went on a mission trip to Russia. A Russian emigre asked me to bring a box to her mother in Moscow. She carefully placed items in a shoebox trying to make them fit and I pondered, “How do you put love in a box…? I think love was one of the items that Justin tried to place in the time capsule but he found that it just would not fit. Instead, he would share it unconditionally with others…sharing his love for his country, his home, his family. THANK YOU for the honor of allowing me to share in your son’s life. Be strong…be safe in the knowledge that he is well. I had the great honor of carrying Justin’s stone deep into the heart of Baxter State Park and to the summit of South Turner Mountain with my dear friends and fellow TSP volunteers. It was a picture perfect day and a challenging climb that yielded panoramic views of the entire Katahdin Basin. Having viewed Karin’s (Justin’s mom) video, I was filled with joy and positive thoughts throughout the climb of this remarkable young man and the light he shared in a world so badly in need of optimism and kindness. As an Army Veteran, I can tell you how truly spectacular soldiers like Justin are in the service…they are unforgettable and indomitable in their spirits. I have met only a few such characters in 30+ years of service and know well the spirit that earned him the nickname “skittles” from his drill sergeants. A person like Justin changes the world around him to a better place and I can only trust my Faith in God that He had His reasons for taking him from us so early in his life. One thing is for sure, however, as we have lost so many of these remarkable men and women in the past 15 years and throughout our nation’s history, we will all see them all again One Fine Day. I greatly look forward to meeting Justin in the green fields of the Great Beyond. One week ago I completed a very challenging hike, while very honorably carrying Justin’s stone. The perfect weather combined with the holiday weekend, the original plan to hike Katahdin took a different path. Disappointed at first, yes, but quickly changed the attitude around and decided to hike Double Top at Baxter State Park. The hike was much more difficult than I expected. In spirit of Justin, I continued to stay positive despite the negative attitudes in my party. People like Justin are extremely special to have, with such a great attitude on life. He seemed to care so much about other people. Towards the summit of the mountain I met up with others hikers who were unable to hike Katahdin. As we took the most challenging part of the hike on together, I shared the Summit Project and the information about Justin I learned from the video. I laughed so hard with strangers from Minnesota, California, Connecticut, and North Carolina. Justin’s infectious smile was with all of us. It was a pleasure to share his story and honor someone who was here to make this world a better place. His memory still spread happiness and smiles to a few strangers on September 6, 2015. 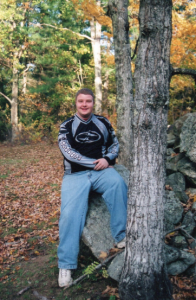 I want to thank the Summit Project and his family for allowing me to share his story. My name is Grady A. Thurlow a member of the Maine Air National Guard and have been in the military for the past 29 years. It was an honor to carry the stone and memories of Justin during the annual TSP/ANP 2015. As I arrived at Thompson Island I was filled with nervousness and anticipation of what lay ahead. This was my first involvement with a TSP hike and I was about to meet many people for the first time. People from all walks of life would come together for one common goal; to honor our fallen Maine Heroes. We were to form a team. We all joined for different reasons but we all had the same goal and that was to honor the memories and share the stories of Maine’s fallen heroes. As our team met for the first time it reminded me a lot of basic training. I thought of Justin and the memories that all soldiers share of those first few days of basic training. As the days and weeks pass during basic, you learn how to become a team. Our team boarded the bus that would take us to the bottom of the mountain at Kebo trail. This would also be our team name. I was asked to carry the American Flag that was given by Mr. & Mrs. Zimmerman, one of the Gold Star families. The flag was in honor of their son Lt. James Zimmerman whose stone I had the privilege of carrying a few months earlier. As team Kebo prepared to start up the trail it began it rain. At first I wanted to complain but as Justin would have said, look on the bright side, it could be snowing. I thought about his great attitude toward facing hardship and adversity. As we climbed the trail, we all shared stories of our heroes. How their stories touched our lives, gave us strength, and showed us courage. As the rain stopped we got to see one of God’s greatest creations; the rainbow. Everyone spoke of how awesome it was and I thought of Justin and his nickname ”Skittles”. How Fitting! We made it to the top and were greeted by a group of Girl Scouts who provided us with cookies and coffee. I had the honor of taking Justin’s stone out of my bag and talking to the girls about him and share the reason why we were doing this event. I pointed out the website to them and hopefully they will read the stories of Maine’s Fallen Heroes. The highlight of my day was being able to spread the word about this great project, and to let you know that Justin will never be forgotten. Our team gathered at the top of Cadillac Mountain. This is where we had a time of reflection and a time to share our feelings and stories of our individual heroes. After this we boarded our bus for the trip back to Thompson Island. There we transferred the stone we carried to the Gold Star Family’s or representatives. This was an emotional time but at the same time a feeling of mission accomplishment. As we said our good byes and shared some refreshments, it again brought me back to Justin and the promise to stay in touch with his memory. I just want to let you know that I was so honored to be able to carry Justin’s stone and help make his memory live on. To the family of Army PFC Justin J. Kennie: I had the honor and privilege to carry the stone of Army PFC Justin J. Kennie as part of The Summit Project hike at Baxter State Park on Sunday, May 29, 2016. There were some challenging conditions on the hike due to the rain, wind and cold weather. The challenging parts of the hike reminded me of how Justin would have handled the situation, with a smile. Justin is the type of person I would definitely gravitate towards. Justin’s selflessness, high-spirited nature and unyielding upbeat personality are traits to be admired. I will always remember how he always smiled no matter how challenging the situation, so much so that his Drill Sargent’s named him “Skittles”. I will take this memory and his personality with me forever. I have no doubt that Justin would have smiled for the entirety of the hike. I had the honor and privilege to place Justin’s stone at the top of Owl Peak at Baxter State Park. This was one of the most moving moments I have ever experienced and somewhere I have no doubt Justin was experiencing it and enjoying it as well. Justin’s character, his selflessness, his passion to become a soldier to serve his country and the optimistic outlook he always took in any situation in life will never be forgotten. Thank you for your service Justin. You were a truly remarkable young man and you will never be forgotten. You are still having an impact on us all. Your desire, character, selflessness and unyielding upbeat personality will be with us all forever. This world is a better place because of you and the impact you had. We took your son’s stone up to Table Rock Mountain today. We had a really great experience with him and we got to know him and talked about him. His story inspired us to keep his story living on. We will always keep Justin in our hearts forever. “My experience with the Summit Project has been great. At first it was tough carrying a stone up the mountain but then I realized that it meant more than just an extra weight in my backpack. Hearing all of the stories was very inspirational. “Justin sounds like a really nice guy. It is cool that he wanted to be a soldier when he was younger and then got to be one! I had the privilege of carrying Justin’s rock up Streaked. When I read about Justin, I felt very upset because I learned Justin died too young and he still had a lot of life left in him when he passed. Justin was a loving and caring person who was happy. He seemed like he liked to help people. I think Justin was like a fun person to be around whether it was hanging out playing paint ball or cooking. I think we would’ve gotten along. I also read that Justin always wanted to be a soldier growing up and he was very involved in his ROTC program. Justin seemed like he was determined to serve his country. I really appreciate all that he sacrificed for our country. I also felt that his stone was very meaningful because it was something Justin spent time making and something that meant a lot to him and his family. I’m honored to be able to say I represented him at the top of the mountain because he was an outstanding young adult. Bringing his rock to the top made me realize that life is very precious and you should cherish every second because you never know what could happen next. Thank you for giving me the the opportunity to learn about Justin and share his memory at the top of streaked mountain. I had the honor of carrying Justin’s stone up Table Rock on July 10. We took a route that was a little more challenging than the one that I’ve taken previously, and there were times that I wanted to complain about the route and how tired I was. I thought about what Karen said regarding Justin’s upbeat and optimistic personality and tried to change my perspective, deciding that instead of complaining, I would find the positive aspects of the hike and encourage the rest of the group to keep climbing. Finding the ray of sunshine is so important in life, and being that ray of sunshine takes a special type of person, one like Justin. I’m betting that the time capsule, when dug up, will contain other examples of Justin’s sunshine. Thank you for sharing Justin with us so that he can continue to inspire. While a thousand more go unspoken for. They say what good have you done by saving just this one? As a mom myself, my heart immediately went out to Karen, the mother of the fallen solider who’s stone I had the honor to carry on September 29th, 2018. Listening to her describe the boy, who turned into a man and the qualities that he developed and the love she had for him was so evident in the stories Karen, Justin Kennie’s mom, had told. In a world filled with so much negativity, it can be challenging for one to find reasons to be grateful and to smile. Justin seemed to understand that happiness came from within and contagiously shared his smile where ever he went. So much that he earned the nickname “Skittles” from his Drill Sargent. He was known as the underdog, who was always there for his friends and fellow soldiers providing encouraging words and a helping hand. His mom remembers how he was always lending a hand at home to help her whenever she needed. Including building her a strawberry garden at their home, where the stone carried in Justin’s honor came from. It was a beautiful day for a hike this late September. The cool mornings required many layers, which could be quickly shed as we made our way up the mountain. Our group varied in abilities, from the young to the highly experienced. Our trail was a beautiful one, although it presented many challenges along the way including angles that when wet could be a bit demanding. Our group quickly supported each other, hand in hand, when needed , to cross these challenges. When our group reached the summit of Cadillac Mountain the sun was shining brightly, perhaps a smile shining down from Justin, as he was remembered through the team work and support our group developed to merge and finish this hike together. Similar to the way Justin looked out for his fellow friend and those in need.